Yes. Medical grade 4, FDA approved lasers are safe when used by properly qualified, accredited and trained laser therapists. Our laser emits a wavelength of 755nm which is ‘non ionising’ or ‘non harmful radiation’. At CleanSkins Laser Clinic we specialise in laser hair removal and as a result our laser therapists are dedicated to hair removal treatments. Our staff are fully qualified, accredited, trained and experienced ensuring correct diagnosis and the safest treatments. The Candela GentleMax Pro medical grade 4 laser system contains the 755 Alexandrite laser and the 1064 NdYAG laser. The Candela 1064 nm NdYAG laser will treat darker skin types and the Candela 755nm Alexandrite laser is best for the lighter skin types and received 1st Place ATnT Choice Award for BEST HAIR REMOVAL LASER for skin types I – type III. The GentleMax Pro system combines the choice of two cooling systems to reduce discomfort and minimise side effects. The GentleMax Pro system is FDA approved (USA Food and Drug Administration), is included in the Australian Register of Therapeutic Goods and has ISO Certification that guarantees the highest possible quality standards worldwide. Are all hair removal devices the same? No. Devices claiming permanent hair removal can be purchased on the Internet for as little as $600. The industry is flooded with inferior unapproved devices claiming to be lasers. These machines will not give you long term permanent hair removal / reduction and if incorrectly used you are at a high risk of serious side effects. Laser hair removal clinics can operate in Victoria with any device claiming hair removal and their staff don’t have to be qualified or accredited to perform the procedures. CleanSkins Laser Clinic recommends you research and choose your hair removal clinic very carefully! More information on choosing your hair removal clinic …..
Is CleanSkins laser hair removal permanent? Once a hair follicle has been successfully treated, it will not return, however there is no laser or IPL machine that can claim permanent hair removal. Our Laser will provide PERMANENT HAIR REDUCTION. Results are dependant on the individual and may vary due skin type, tanning, hair colour, medications or hormones, varying considerably between people and in each person between areas. Laser and IPL can only target active hair follicles creating heat within the hair follicle damaging the cells that enable hair growth. It cannot be legally claimed to provide PERMANENT HAIR REMOVAL due to unpigmented hair and the possibility that some dormant follicles may become active in a later stage of life. Will CleanSkins Laser successfully treat me? CleanSkins GentleMax Pro duel laser system gives optimum results on people of all skin types with dark hair. There are no hair removal devices on the market that will remove hair absent of melanin i.e. white or grey hair. Blonde and red hair can be treated only if there is enough brown pigment in the folicle, however not as successfully as black or brown hair. It is highly likely that treatments on blonde and red hair will only ever give temporary results. Contact Cleanskins for a free consultation to see if our treatments are right for you. We will not waste your time or hard earned money! Treatment time varies depending on the surface area treated. Usual treatment times range from 5 to 60 minutes (5 minutes for an upper lip to 60 minutes for 1/2legs). On average 4 to 8 treatments are required. It is impossible to pre-determine the exact number of treatments as they vary from person to person. Generally speaking the thicker and darker the hair the better the results from the treatment. On average 3 to 5 treatments are required in order to see noticeable results, with at least 80% hair reduction. Some patients may require top-up treatments in years to come. Cleanskins provide free, no obligation consultations where an experienced technician will discuss a treatment program suited to your individual requirements. For facial treatment initially once every 4 to 6 weeks. (On going maintenance treatments are usually required due to the density of follicles on the face, cases of Poly Cystic Ovarian Syndrome, Insulin Resistance and other hormonal imbalances. It will usually take approximately six treatments to control the hair growth. Patients on a maintenance program usually only require approximately 4 treatments per year. Body treatments once every 8 to 10 weeks. Lengthy periods between treatments will not achieve optimum results. All areas of the body excluding close to the eyes and the inner ear can be safely treated. The most common areas treated are upper lip, chin, face, neck, bikini line, legs, chest, underarms, back and abdomen. The majority of people treated don’t experience side effects and return to normal activity immediately without any adverse sign of treatment. Few experience mild redness or mild swelling that on average lasts from an hour to 24 hours. In rare instances redness can last longer and some people have experiences mild grazing which dissipates over a short period of time. Some people have found the treatment uncomfortable. Most people find it more tolerable than waxing. It is likened to the flick of an elastic band on the skin which dissipates quickly. Approx. 10% of patients require anaesthetic for their treatments. Beware of clinic’s that advertise ‘pain free’ or ‘virtually pain free’ treatments.Laser and IPL technology both work by damaging the hair follicle. If the intensity is too low you will not get optimum results equaling more treatments (= more cost!). At CleanSkins we offer hair removal from as little as $55 per treatment. 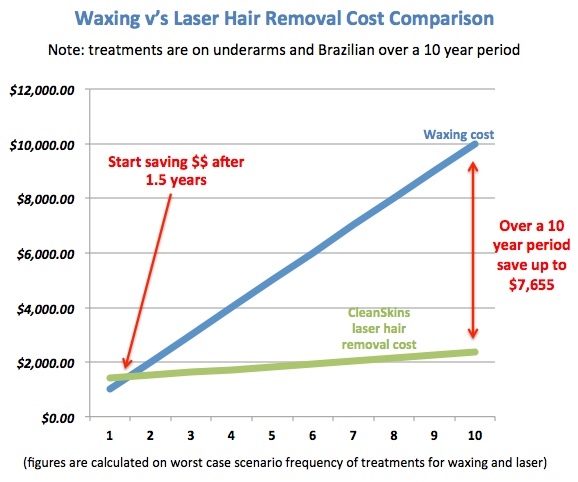 Compared to the frequent ongoing cost of waxing laser is by far the cheaper alternative.